“Bandwith exceeded” must be the most bittersweet phrase to a blogeer. It means that you’re getting really good traffic. It also means your blog is toast for the time being, until the administrator increases the bandwith again. Time for “the blog is fried” grieving process! The former Bond, the former despot: Pierce’s next movie role? Bloggers praise the actor’s aiblity to breath life into the character of James Bond after so many previous films. “Daniel Craig is the best Bond since Sean Connery. 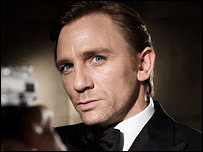 Connery created the part, but Daniel Craig brings him to life, a heroic task after decades and umpteenth Bond movies, a much more difficult task than Connery’s,” Fausta blogs. “This Bond is everything he should be: Cold, callous, egotistical, and most of all, dangerous. He has no qualms with killing,” Justin at Corpreform adds. For the blond bombshell in black tie, engraveable sterting silver cufflinks at the Christmas Store – perfect for monogramming. Fidel misses his own b-day party , claims he’s "not dead yet"
Frail Cuban leader Fidel Castro has stayed away from the opening ceremony of his 80th birthday celebrations in Havana on doctors’ orders. A message apparently written by Mr Castro was read out saying he was not yet strong enough to attend the event. Maybe he’s in a freezer, after all; maybe not? Presidents Evo Morales of Bolivia and Rene Preval of Haiti have confirmed their attendance, along with former Ecuadorean President Rodrigo Borja and Nicaraguan President-elect Daniel Ortega. Also expected are Argentine soccer great Diego Maradona, South African singer Miriam Makeba and Colombian Nobel laureate Gabriel Garcia Marquez. Nobel Peace Prize winner Adolfo Perez Esquivel, an Argentine human rights campaigner, was also expected. Hugo: . . . but, but I even brought you an arepa [a Venezuelan cornbread], and a painting. . .
Fidel: I saw you with that Putin [pun on Putin’s name. Puta = whore, putin = little male whore], and with that Iranian, and you compared me to Ho Chi Min’s statue, it’s . . .
Hugo: But my chulo [term of endearment that can also mean pimp], all I’ve done. . .
Hugo (covering his eyes): My God, you weren’t protected? You didn’t tell me. That’s not mine! Fidel: You don’t love me. Hugo: Don’t say that my little one, because I adore you with my life. Fidel: I’m suing for child support. Hugo: Now you’re squeezing me. . .
Fidel: Evil man (crying) abuser, whore . . . Image changes to the Tierra de poderes/Brokeback Mountain poster. Announcer’s voice: Tierra de poderes, the new soap opera. Castro’s good friend and political ally Venezuelan President Hugo Chavez wasn’t expected to come; he is up for re-election on Dec. 3. But Chavez has promised to dedicate his anticipated electoral victory to Castro. 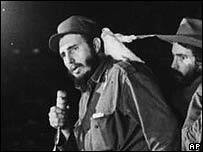 Intentionally or subliminally, the Beeb’s article has a picture of the dove landing on Castro’s shoulder, an event considered as symbolic of his powers by believers in santeria. Do not underestimate the power of that image among his followers. Are you in Cuba? How have people there reacted to Mr Castro’s inability to attend his 80th birthday celebrations? Send us your comments. We live in an age of irony, indeed. But the country whose government is currently going after the hijab most vigorously is Tunisia. The wearing of the hijab has been spreading rapidly in Tunisian towns, prompting President Ben Ali recently to reactivate a 1981 decree banning the wearing of the hijab in government offices, schools, universities, and public places in general. His government views the hijab as one more sign of the unwelcome but growing influence of Islamists in Tunisian society. This past Ramadan, in a reversal of the standard pattern for Muslim religious police, Tunisian police were seen tearing headscarves off women in the streets. Given the Islamists’ ferocious determination on this point, it is worth asking: Why exactly is covering the female so important to them? The obvious answer is that it is a means of social control. Not coincidentally, it is one of the only issues on which Sunni and Shia extremists agree. It’s not by chance that use of the hijab really took off after Iran’s Islamic regime came to power in 1979. Some Shiite militias in Iraq have actually started forcing women–Muslim or not–to wear the veil or face the consequences. Not only in Iraq are women forced to veil themselves – in France, women are gang-raped at the banlieus if they’re not wearing veils, whether or not the women are Muslim. One solution to this debate may be profiling of women who wear hijab for investigation of domestic or other abuse. If [Olivier Guitta, writing at] Weekly Standard [see above] is right, then wearing hijab is a sign that a female has been intimidated and possibly beaten. If so, then not investigating the possibility of such abuse where it occurs, i.e., failing to implement hijab-based profiling, discriminates against women. Those who would oppose such investigation would be arguing that they favor physical abuse of women. Obviously, CNN foresees quite a positive outcome. Did they just hire some one from the World Wrestling Federation??? Do keep those words in mind while we hear all the propaganda, the insults, and the Pope Rage in Istanbul. As I write the anchorwoman at CNN keeps talking about the Pope making an apology. Venezuelan strongman Hugo Chavez is an ally of the Iranian mullahs, a supporter of North Korea, a close friend of Fidel Castro and a good customer for Vladimir Putin’s weapon factories. Now he’s also a business partner of Joseph P. Kennedy II. The former Democratic Congressman describes the deal he’s cooked up with Mr. Chavez as charity for low-income consumers of heating oil. But it’s worth asking what the price of this largesse is to Venezuelans and to U.S. security interests. The arrangement is this: Mr. Chavez’s Citgo–a Houston-based oil company owned by the Venezuelan government–is supplying home heating oil to Mr. Kennedy’s Citizens Energy Corporation at a 40% discount. Citizens, a nonprofit outfit, says it passes the savings onto the poor, aiming to help 400,000 homes in 16 states that would otherwise have trouble heating their homes. In the process, Mr. Kennedy happens to get a high-profile publicity plug. If you think you qualify, says the television ad that drew our attention to this partnership, just dial 1-877-Joe-4-Oil. I was slightly ahead of the news curve last week on this. Are we so far separated from the rest of the world that we don’t have a reason to see what’s going on around the rest of the world? Is it arrogance? Maybe our nation is too large, we have enough newsworthy events happening here in the United States, to keep our attention off of the rest of the world. Bolshevism, Fascism, Nazism, Islamofascism… all simply vehicles for the ancient passions and values of the Old World to re-channel themselves more effectively, so as to destroy the New. The people who developed these ideologies have studied and exploited the weaknesses of the New World, to the point that all of them have seriously threatened it. Steven Warshawsky Europe’s Ineradicable Viciousness? Don’t forget to check my Christmas shop – I’m adding new items every day. Today’s new item: orchids. My thanks to Maria and Larwyn! * Characters accept rather than question the logic of the magical element . . .
* Mirrors past against present; astral against physical planes; or characters one against another . . .
* Open-ended conclusion leaves the reader to determine whether the magical and/or the mundane rendering of the plot is more truthful or in accord with the world as it is. It is all too easy to see the similarities between the fictions penned by Garcia-Marquez, the surreal nature of negotiating with terrorists such as Pablo Escobar, and the presumptions of American political elites who believe that by engaging Iran and Syria — thereby admitting their involvement in Iraq’s chaos — that such chaos might be ended on terms favorable to either the US or Iraq. Such dreams are the stuff of our own variety of magical realism, but rather than resulting in pleasant narrative escapes, they will result in the irrelevance of the United States, whether one means its military power, its national interests, or its once-admired revolutionary Democratic ideals. What are the implications of media deceit? A lot more than the endorsement of tired and failed political agendas and ideologies.In fact, media deceit has lead to an environment where the deaths and killings of innocents, so that some agendas are presented in a more favorable light than others. It was the media that ignored the genocide that resulted in the death of over a million Africans in Rwanda, even as the UN military commander pleaded with UN higher ups for orders to defend the helpless victims that never came. The deliberate lack of press coverage could not hide other truths. While Rwanda is correctly portrayed as yet another failure of the UN, they weren’t alone in their culpability. Even as the UN maintained it’s customary inertia , the American administration under Bill Clinton was asked to help. They refused. After the humiliating defeat in Somalia, Washington was delighted to wash its hands of Africa and Africans. The MSM has been using bogus officials to supply chaos to their stories and based on those same stories has decided Iraq is now a official civil war. 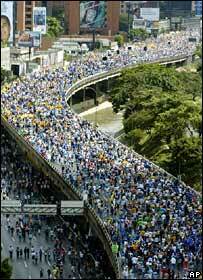 While Chavez blocked the highways into Caracas, 1.4 million turned up. A memo for Hugo Chavezs followers. 22. In summary, if you wish to see Venezuela joining the club of the failed states and Venezuelan society becoming more miserable than is already the case, vote for Chavez. You can choose to vote with your stomach or with your heart but be prepared to live with the results of your decision. If you vote to return to the Paleolithic you, your children and the children of your children will suffer the consequences. When you vote for Chavez you will be influencing the life and well-being of all those who do not wish to see their country falling in a swamp of misery, oppression and corruption. You should know that we would dispute Chavez and his followers day after day, millimeter after millimeter, the space and the future of our country. We, who wish to live in a dignified, free and spiritually and physically clean country, will never stay idle while the illiterates of the revolution, dressed in blood red garments, pretend to take over the country. This battle for freedom and democracy in Venezuela is going to be long and cruel but we will prevail. We will wake from this nightmare no matter the price we will have to pay. Let’s hope it’s through democracy and growth.